(CNN) -- Australian Treasurer Wayne Swan unveiled the 2009-10 Commonwealth budget, the centerpiece of which invests $22 billion (US$16.8 billion) in national infrastructure, saying it was forged "in the worst of economic times." 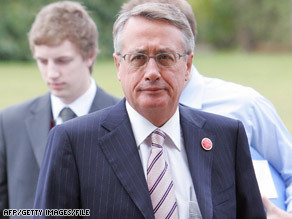 Australian Treasurer Wayne Swan unveiled the budget on Tuesday. The government expects unemployment to peak at 8.5 percent in 2010-11 and does not foresee a surplus until 2015-16, according to details the federal government announced on its Web site. The budget will invest $4.5 billion (US $3.4 billion) in a Clean Energy Initiative that eyes a low-pollution economy, thanks to reliance on solar energy, carbon capture, and the development and use of renewable technology. Under the nation-building plan, the government will invest $8.5 billion (US$ 6.5 billion) in roads, metro rail and port infrastructure. Of that, more than half will be dedicated to the construction and planning of nine metro rail projects across the country. In his budget speech on Tuesday, Swan said that without action, the GDP would contract four times as much. By contrast, the budget will boost up to 210,000 jobs. The budget also will increase the small business tax break to 50 percent for eligible assets. In what Swan calls the biggest downward revision in Australia's history, the government lost $210 billion (US $161 billion) in revenue, or the equivalent of the entire government spend on health and hospitals. Swan said the government faced either a dramatic slash-and-burn of vital services and higher taxes or a program of "responsible borrowing," and the government adopted the latter course. "Net debt is forecast to peak at 13.8 percent of GDP in 2013 14 before falling again," Swan said in a prepared statement.